‘Twas the night before Christmas and all through the mansion, only happy haunts were stirring, including Jack Skellington! D-COT has included this spooktacular gift in the Jukebox since December 1, 2009, however, every September to January since 2001, Jack has been bringing Christmas cheer to the grim grinning ghosts of Disneyland’s Haunted Mansion. Since then it has become, perhaps, the most popular seasonal overlay for any attraction in all of the Disney theme parks world-wide! People longing to visit Disneyland for occasional trips or for the first time are known to Zero in on this particular season just because of this side of the Haunted Mansion. The experience makes it a truly unique draw to the Disneyland Resort for something people can’t get at Walt Disney World. Even taking into account the Disney parks overseas, only Tokyo also incorporates this overlay. You won’t find it in France or China. When Disney set out to give this attraction this new seasonal look, it quickly became apparent that the whole audio script would need to be changed. There was only one problem. The original voice cast for the attraction from the 1960s had since joined the dearly departed. Of course, something like that wouldn’t scare Disney away from their festive idea. They found talented voice actors to remake the script with their best vocal imitations of the original cast. The new cast did a rather good job as Corey Burton’s Ghost Host voice, for example, is nearly indistinguishable from that of Paul Frees’ original voice for the part. In fact, at Walt Disney World’s Haunted Mansion, there have been a few updates to the Ghost Host’s script since the 70s which Corey Burton had to add. Few, if any, guests can tell where his part starts and ends without researching it ahead of time. 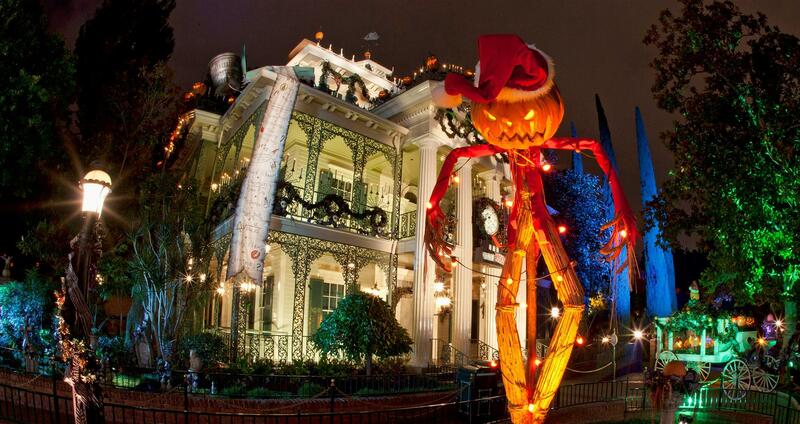 While the film, “The Nightmare Before Christmas” from 1993 continues to receive mixed reviews, there’s no denying the attraction overlay that is based on the film is a pumkin-smashing, bell-ringing hit! The stats of our D-COT track adequately reflect the popularity this seasonal delight has garnished for itself. It has a play count of 12,347 with a weekly count of 19. D-COT Supporters have added it to 19 Custom Playlists, and 83 Members call it a Favorite. It has a 4.8/5 average rating with 40 votes. So if you’re looking to have a little Oogie-Boogie with your Jingle Jollies this Christmas or might enjoy having Santa Claus drop in on the Pumpkin King next Halloween and won’t find yourself in Disneyland, stop by the Jukebox for a listen to this frightfully fun treat! I reeeeaaallly love the soundtrack for this ride! Can’t wait to experience it one day! It is an awesome overlay. Excited to experience this again next week! Yessssssssssssssssssssssssssssssssssssssssssssssssss!!!!!!!!!!!!!!!!!!!!!!!!!! I rode this 8x last week!!!!!!!!!!!!!!!!!!!!!!!!!!!!!!!!!!!!!! LOVE LOVE LOVE the ride, AND the soundtrack!!!!!!!!!!!!!!!!!!!!!!!!!!!!!!!!!!!! Have never done it during Christmas, Halloween was fun but I would love to see it at Christmas time !! I really want to experience this!